Before proceeding into an analysis of each of the department’s main agencies and functions, however, the reader may find it useful to review the following brief explanation of the philosophy undergirding the recommendations made in this section. American traditions of law and liberty recognize a fundamental distinction between the activities of government and those of society at large. Since the Colonial Era, the coercive institutions of government have been widely understood to be appropriate to the protection of life and property from criminal violence and fraud. Other concerns, however basic or vital, historically have been addressed by voluntary civil institutions. This theoretical understanding of, and practical distinction between, the different roles of state and society — spelled out in the federal and state constitutions — have been key to unleashing the vibrant cultural and economic life that has flourished in this country since its inception in the 18th century. In other words, America’s Founders understood that while government may serve, in some ways, as the protector of a society’s culture, it is but a product — not the source of — that culture. Kirk’s definition helps to make the salient point. Within a free, or civil, society, government is just one of many threads in the broad and colorful tapestry of human life. It has the narrow and limited role of guardian, and when it steps outside of that role, its growth into other spheres of life soon results in an increasingly unfree, or political, society. The difference for the average citizen is this: In a civil society, citizens themselves make the decisions affecting their lives. In political society, government officials make many or even most of those decisions for citizens. The citizen’s judgment about what is in his or her own best interest is supplanted by the judgment of others, who may not have his or her best interests at heart — and may not even know what those best interests might be. But perhaps the most dangerous aspect of a political society is that the state sets itself up as the very definer of a society’s culture rather than as its guardian. In such a situation, there comes to be an "official line" on everything. This official line, instead of being reached by open academic inquiry and consensus, is instead asserted and enforced by a bureaucratic minority operating the coercive machinery of the state. Instead of being open to challenge and revision as new nuggets of truth are gleaned by scholarly prospectors, the government-enforced official line is impervious to new evidence or interpretation. Thus there is the spectacle, in some countries, of a "Ministry of Culture," that may actually criminally prosecute those who hold the "wrong," i.e., governmentally disapproved, opinions. This country is not yet that far down the road to censorship and statism, but the persistence of the phenomenon known as "political correctness" reveals the ever-present danger to intellectual and academic freedom when citizens cease their vigilance. 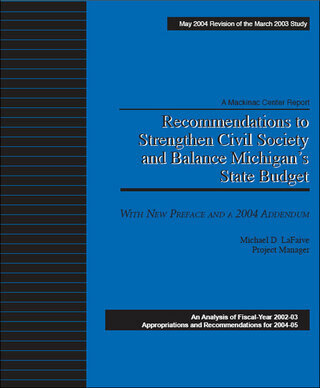 In short, the Mackinac Center is not recommending budget cuts for the Department of History, Arts and Libraries because it does not want or like art; on the contrary, our reasons are precisely the opposite.